Nearly every time I inherit a SQL Server environment, I’m only given a partial list of SQL Servers that exist on the network. It’s my usual routine to get permission to sniff the network then run about five different programs including Idera’s SQL Discovery and Microsoft’s SQL Server Assessment and Planning Toolkit. 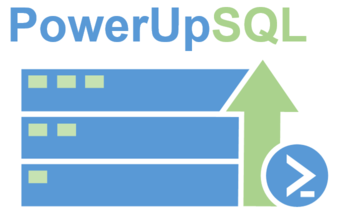 I always thought it’d be cool to have one comprehensive PowerShell command that could do the work of all the above and was ecstatic to see NetSPI’s Scott Sutherland had written a few commands to do just that in his awesome PowerShell module PowerUpSQL. When I saw Scott’s multi-pronged approach (including some UDP magic 🎩), I asked if he’d be interested in contributing to dbatools and he said yes! He submitted a gorgeous mock-up and I was so excited. Then came the PR, complete with great documentation and multithreading. I asked our architect Fred Weinmann to perform a code review and he was so taken by the command, he refactored it with some C# magic including strong types. This command, which is available in 0.9.314, is a beauty! 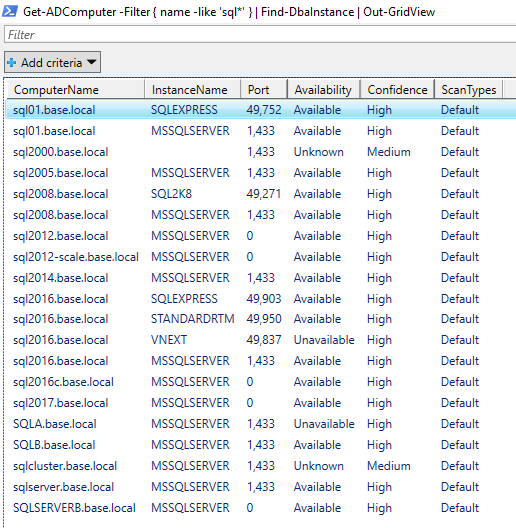 This command searches for SQL Server Instances. It supports a variety of scans for this purpose which can be separated in two categories: Discovery and Scan. Connects to Active Directory to look up all computers with registered SQL Instances. Not all instances need to be registered properly, so this is not 100% reliable. By default, your nearest Domain Controller is contacted for this scan, but you can specify its DistinguishedName and the -DomainController parameter for greater control. If credentials were specified using the -Credential parameter, those same credentials are used to perform this lookup, allowing the scan of other domains. This uses the default UDP Broadcast based instance enumeration used by SSMS to detect instances. Note that the result from this is not used in the actual scan, but only to compile a list of computers to scan. To enable the same results for the scan, ensure that the -Browser scan is enabled. This discovery uses a range of IPAddresses and simply passes them on to be tested. By default, it will enumerate all ethernet network adapters on the local computer and scan the entire subnet they are on. By using the -IpAddress parameter, custom network ranges can be specified. Check out the help for more information on range formats. Once a list of computers has been provided, this command will execute a variety of actions to determine any instances present for each of them. Tries pinging the computer. Failure will NOT terminate scans. This scan uses credentials specified in the -Credential parameter if any. Success in this scan guarantees high confidence (See parameter -MinimumConfidence for details). Tries connecting to the TCP Ports. By default, port 1433 is connected to. The parameter -TCPPort can be used to provide a list of port numbers to scan. This scan detects possible instances. Since other services might bind to a given port, this is not the most reliable test. Here are just a few usage examples. And for more detailed information, you can use Select * to expose all properties, including those hidden by default. Warning! This one takes a long time due to the IP scan. How long? About 2 hours on my single subnet lab. Want to know more? Check out Get-Help Find-DbaInstance -Detailed. This includes additional information and discusses parameters like -SqlCredential, -MinimumConfidence and more. Thank you so very much for sharing your hard work, Scott! I’ve wanted a command like this for years. And thank you, Fred, for the time and love you invested into the dbatools refactor. Unable to find type [DbaInstance]. hey jim, what is find-dbainstance\find-dbainstance.psm1? that is not our module. please update to the latest version of dbatools and try again. I do believe this is working as the script has been running for more than 5 hours now. The issue is that we have a /13 in our environment and its going to take FOREVER to finish scanning that entire range. Is it possible to limit this command to a segmented server subnet, for example a /24. As all my servers should live on this segmented subnet. This would serve to expedite the scanning process. Secondly, does this particular command work when using the pipe or perhaps piping to a CSV file. I truly appreciate your time and teams work into this project. Thank you and have a great day! Yes, you should always get permission before running any scanner on the network.